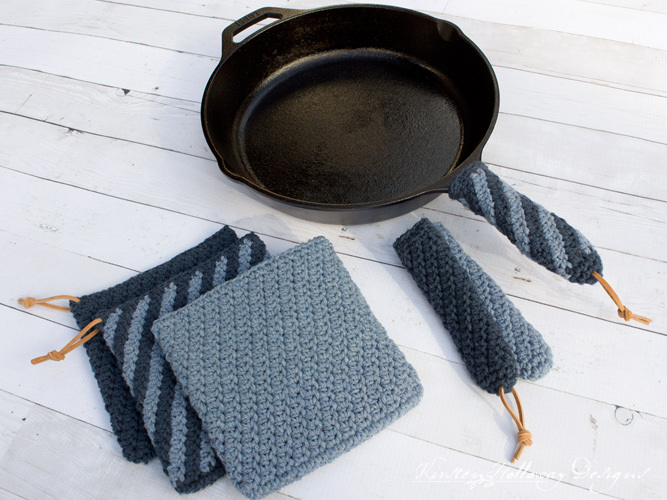 With Father’s Day coming up next weekend, this easy, beginner friendly cast iron handle cover and hot pad or potholder crochet set will make a practical gift for the man in your life who loves to cook–whether they use it at home in the kitchen or while off camping! You can even make it for yourself! Cast iron cookware is such a popular thing right now! Its longevity, indestructible nature, and ease of clean up make it an ideal addition to any kitchen. 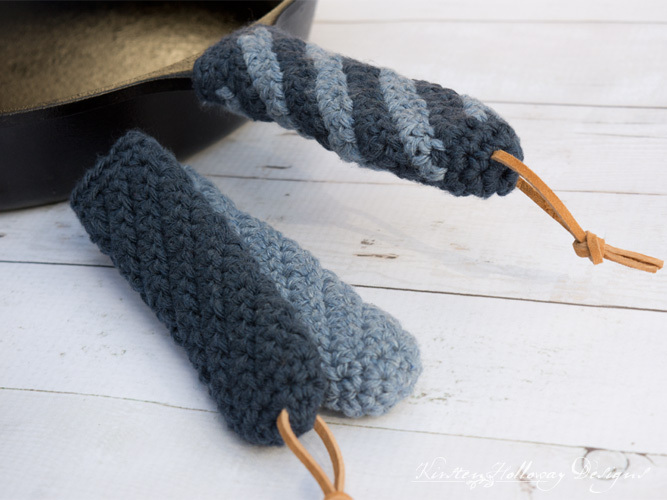 My husband, who absolutely loves to cook, swears by cast iron as the ideal medium for making just about any dish, and when we switched to using mostly cast iron cookware in our home a couple of years ago, I knew I needed to crochet some handle covers for him. This quick and simple crochet handle pattern is the exact same one my family has been using for handling our our cast iron cookware for the last two years–and so far none of us have received any burns! It’s the best! Just recently, I also designed a crochet pattern for a double-thick hot pad/potholder or trivet to place hot pans and skillets on which completes the set. The double thickness of the hot pad makes it so thick and squishy–I can’t imagine ever wanting another one! 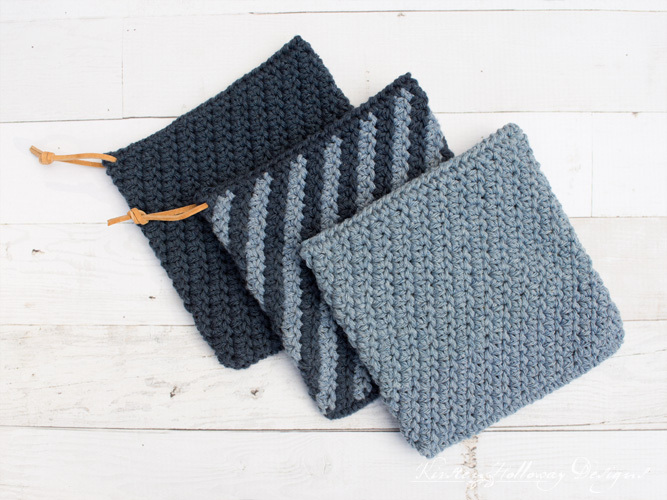 Both the hot pad pattern and cast iron handle cover uses 3 stitches and are worked in continuous, unjoined rounds which makes it a nearly mindless project you can crochet quickly. I also have included basic instructions for making a two colored version using the “Fair Isle” crochet method which places the carried colors at the back of your work, rather than crocheting over them (as is done in tapestry crochet). This method is a little more time consuming and complex when you first start out, but take it one color change at a time, don’t try to rush, and you’ll most likely get the hang of it after your first handle cover. Feel free to make this set using team colors, or, if you choose to make it near a holiday, you could use seasonal colors (for instance, alternating red and white will give it candy cane appearance). I chose Lily Sugar’n Cream cotton yarn as it will not melt like acrylic* when exposed to a hot cast iron handle (keep it under 410° F though so it doesn’t catch fire). Cotton is durable and easy to wash, so keeping your cast iron handle covers and hot pads clean will be a breeze. Toss them in the wash with like colors, on cold, whenever they get dirty. You will notice that when you first make the handle cover it is very tight and slipping it over the handle takes a bit of tugging. This is purposeful, because after a few times slipping it on and off, the fibers will loosen up (the cover will still protect your hand from heat). *There are a few more safety precautions to keep in mind when using this crochet cast iron handle cover and hot pad set, and I’ve included those in the “additional notes” section, so please, please remember to read them ALL (and practice common sense when dealing with fire/hot metal). (Optional) 8″ of 1/8″ leather shoelace per hot pad or handle cover <–I found mine at Michael’s crafts. Handle cover: 1 1/2” wide by 5” or 6” long. Handle: The handle cover should fit snugly on the handle (aim to have it be about 1 1/2″ across at the most), but loosen up so it slips on and off the handle fairly easily with wear and washing. Hot pad: Gauge is unimportant. It is easy to adjust the pattern up or down to fit your needs. See additional notes section below. *it is VERY, VERY important that you use only 100% cotton yarn for this project (acrylic will melt), AND that you remove the cozy while cooking so it doesn’t catch fire — use it ONLY to lift the pot from the stove, or while holding the handle to stir what’s cooking. Do NOT leave it on the handle unattended! * In short, practice common sense. -Common sense includes NOT leaving this handle cover on if you need to bake a casserole in the skillet in the oven. -If you want a thicker handle cover, try crocheting with 2 strands of yarn and going up a hook size or two. This single strand handle cover has worked well for all of our family’s cooking needs in the past 2 years, but thicker won’t hurt if that’s what you want to do! -The main part of both the handle cover (round 4) and hot pad (round 2) are worked in continuous rounds. Do not join. -Your handle will be quite snug the first time you put it on your cast iron skillet, or pan, this is intentional because they do relax with wear/washing. Let it sit on the handle to stretch out for a few hours prior to use. -These are machine washable! When they get dirty, simply throw them in with like colors on a cold water wash (or follow the washing instructions on the skein if you have any doubts). -to create a striped cover or hot pad, join the second color after round 3, and change color every 2 stitches. I switched colors by pulling the new color through the center of the hdc stitch. You may need to go up to a 5mm or larger hook when doing things this way as it is easy to tighten your tension if you are not familiar with the “fair isle” crochet technique. I’d recommend you try making a solid color cover first if you’ve never done “fair isle” crochet before, to familiarize yourself with the pattern. -If you decide to use two colors, you may want to go up a hook size or two as it’s easy to tighten up your tension when changing color every 2 stitches. Your tension should still be fairly tight for this project. You don’t want holes! 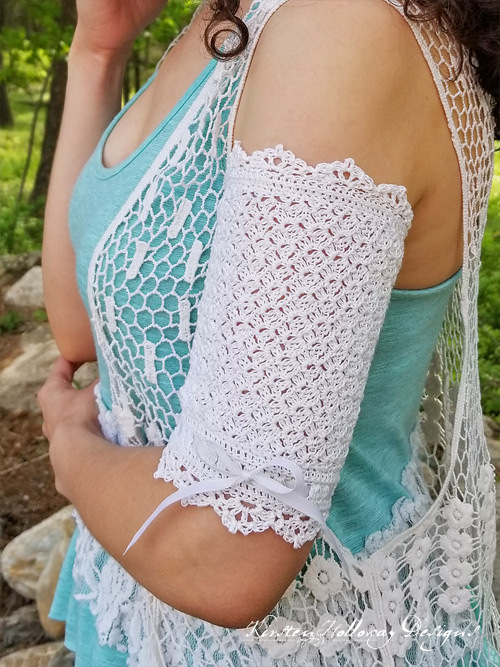 -This is a very versatile piece and can be adjusted to make not only various sizes of hot pads or potholders, but also small bags and coin purses, glasses/phone cases, and even decorative pillows. Leave the top open for bags, purses and cases. Note: To adjust the size, work in multiples of 4. Your beginning chain should be half of what you want your final stitch count to be. Repeat round 2 until your potholder is as tall as you’d like, then sc around the entire top. 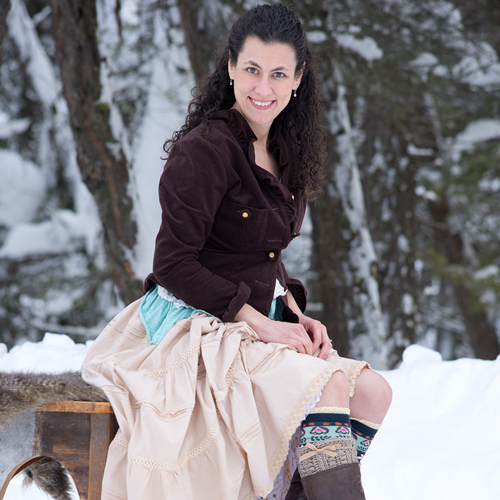 Cut yarn leaving a 18″ tail. Sew top closed with a whip stitch. Cut 8” of 1/8” leather lace (a leather shoelace will work for this too). Thread through corner of hotpad or top of handle cover. Knot the ends together. Love this pattern. I do make it larger with 32 or 36 chains. The handle covers would also be great for covering a curling iron or straightening iron if you need to pack it before it is totally cool. I have a cast iron handle holder that I use for this purpose. Might have to make one instead since these look much nicer than what I have and I happen to have some Sugar and Cream yarn to use up! Round 2 of the potholder instructions says “hdc, sl st in next st…”. Do both the hdc and the slip stitch go into the same stitch? Or do they each go into separate stitches? Hope this makes sense…look forward to your insight….. Thank you Kirsten! It turned out perfectly! one to start with. Thanks!! I love your patterns a lot. This one is great because the only pans we use are cast iron. Thanks for sharing your creativity and beauty.